The weather is warm and for those who love aviation, it means we are spending more and more time at the airport! One group of individuals you will often see swapping stories with their hangar neighbors and other flying friends is the agents at Aviation Insurance Resources (AIR). Each agent has a second “home” and that is located at Frederick Municipal Airport (KFDK) in Frederick, MD. 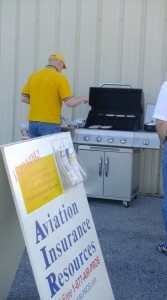 Every Friday when the skies are bright AIR president, Jon Harden, can be seen pulling out the grill for a weekly cookout at the hangar. AIR hangar cookouts welcome many friends old and new. One gentleman flew two urs for the opportunity to eat and chat with fellow pilots at the inaugural cookout for this year. Recently, a new air traffic control tower came into service at FDK, and the controllers became quite anxious to finish their shifts and join the party themselves. At the AIR cookouts, everyone is welcome and people quickly become part of the pilot family. Looking for a new airport to visit? Interested in a $100 hamburger with your favorite insurance agent? Just give AIR a call toll free at 877-247-7767 and ask when the next hangar cookout is, we’d be happy to have you! How Only $20 can Double your Aircraft Renter Insurance!